Does an anvil work harden? Been hearing some talk of new anvils with soft faces. 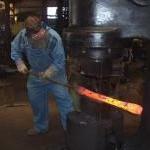 I know that steel will work harden over time as in rr track but is working hot steel enough to harden an anvil and how long would it take to produce a measurable difference? Does steel type come into play like high carbon v medium? The higher the carbon content t he faster it will work harden. Sort of, the steel has to be worked enough for it to harden so a hardened, high carbon anvil face may not get much if any harder. That sounded confusing. By "worked" I mean the molecules in the steel have to be moved against each other ENOUGH for the plate to work harden. Modern anvils aren't made hard from the factory for liability reasons so they will work harden. Of course it'll harden measurably every time you strike something on it. Of course modern tech allows us to take pictures of individual atoms and measure all sorts of properties. What do you want to measure it with, a file or electron microscope? Don't worry, it'll harden up faster than you think and it'll continue to get better for a few years anyway. If you really want to speed things up use a powered a planishing hammer so as not to mark it up. Think standing over your anvil running a jack hammer with a planishing bit. My Fontanini (new, H-13ish alloy) came so hard that a quality file wouldn't touch it, had to use carbide burrs to ease the edges of the hardy and pritchel. 5 years of professional use later it's starting to show a little wear but in the right light you can still see the Blanchard grinding marks. Refflinghaus makes a RockwellC hardness claim in their literature, and the feedback I've seen is that they are the real deal. Neither are cheap, but you get what you pay for. how long would it take to produce a measurable difference? How much time are you putting into work hardening your anvil? In a shop from the 19th century the anvil might see work 10 hours a day for 6 days a week including a master smith and strikers... thats more than even the pros today do, thank goodness for modern power hammers! Working hot steel on the face of your anvil will not harden it as the face has to be hot enough to glow before any of the types of quenching can work. Working hot steel on your anvil will not draw temper on it UNLESS you get it up to over around 500-600 degF; hot enough that if you place a piece of paper on it it will burst into flame. I've known professional smiths whose large work was such that they boiled the kettle for their lunch tea on the anvil; but still under 451 degF. Working hot steel on the face of your anvil will not produce dislocation climb and thus removing work hardening from the face because it's not hot enough either. Having the apprentice plannish the face of a softer anvil to harden it up is described in some older smithing books. Some alloys work harden faster than others. IIRC high manganese alloys do so. HOWEVER work hardening is NOT a replacement for proper heat treating and proper alloy choice as you can get much higher hardness values through Heat Treatment than work hardening. Why make uneducated guess when the information is available? I concede to Thomas, metallurgy is one of his degrees. My most current information came from talking to a representative of Centaur who said the anvil's they carry work harden in use. I Emailed in regards an issue that came up here with one of their products. Serves me right for accepting the word of a company rep at face value. I apologize for offering an opinion a lot less educated than I'd thought. My bad. Unfortunately my previous post has exceeded it's time limit or I'd edit all but an apology. They do work harden in use; it's just not as hard as a properly hardened face. I have days I'm wrong so often I get gun shy about anything I say or do. Heck today is starting out "great." I let Abbby, Deb's retired service dog out for morning business and forgot about her. It finally dawned on me when she wouldn't come down stairs for breakfast. So THAT'S why it sounds like a dog barking outside! Ronnie, the new dachshund pup is in season and wears a diaper when we can't keep an eye on her so I just tried to put the diaper on Baxter the 8 yr old male dachshund. Noticed the plumbing when I tried wrapping it around his waist. He wears a blue and white collar, nope didn't notice it or the different shape of his head. It's looking like one of those days. <sigh> I think I'll keep opinions to the simple stuff today. The quality is also the reason very few damascus makers will use it in pattern welded steel, although it makes nice dark lines due to the manganese content. It isn't very different from O1, just a lot less consistent and O1 has some vanadium and tungsten to make it a better knife steel. My anvils are all in the HRC60 range, and much better quality steel. Thomas: Your comment about getting an anvil hot enough to boil tea water reminds me of an old saw that if your anvil is cool enough for you to sit on/lean against when you eat lunch you haven't been working hard enough through the morning. I"ve worked on anvils on larger thumblatch forgings that the anvil indeed needs to be cooled periodically.. I usually do it every heat.. It can certainly get hot enough to boil water.. In some of the video how to's you can see the water steaming on the anvil.. The martensite in a hardened object takes a certain amount of time before it fully transforms (locks into place) into the full quantity of martensite that it will achieve.. This is why you have some time to straighten a knife while it's still over 400F as the structure is not fully locked yet.. This is also why cryo treating of blades an other items is becoming more popular because it lock the Martensite fully without any added time.. Or days to fully reach the maximum which is what happens after a regular quench cycle.. So and anvil will get slightly harder after it been hardened just as most carbon steels over 0.77C according to one book or 0.83C by another.. The flip side of this is that heat applied to an anvil over a given period of time will in fact make the anvil softer.. So, if a 2000F piece of steel with enough mass can in fact raise that surface temp high enough even if only briefly it is technically tempered.. Or being tempered.. There is also a school of thought that goes in the fact that if a given temperature is never exceeded the hardenes will never go lower than the temperature at which it was originally tempered at.. IE straw, bronze, peacock, blue, green.. So for a given temper color/temperature.. If the temperature never goes above this the item no matter how long at the temperature will stay at the same hardness/temper.. This means you could bring an object to a light straw (temperature) and leave it there for days and it would get no softer or loose any additional Rc points..
My experiences goes the opposite direction but it's funny how even now there is information that is taught at college levels that still has different ideas of how something is done..
On that note.. A work hardening steel will actually harden locally right at the spot of impact.. It will indeed harden over time as the steel is compacted.. It's been a long time since I read about it, but basically there are several different types.. One is a scratch resistant and one is impact resistant.. The scratch resistant one creates a layer of material that is fairly thin but very hard when abraided or rubbed with great pressure.. The other is when there is a substantial impact..
Old wrought iron anvils that have sway are exactly this.. The wrought iron is being compressed or cold worked and is in fact becoming denser/harder. 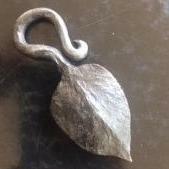 It's the reason Wrought iron can be made into springs by cold working it..
A wrought iron anvil will take a certain set and then be hard pressed to get more out of it.. It's one of the reasons cast steel anvils or 2 piece anvils like Hay Buddens were said not to take a set.. The steels did not compress where the wrought iron does..